A few years back I won Dannika Dark’s Seven series on Audio. Best dang thing that ever happen. Since then I have devoured her backlist and impatiently wait for each new release. 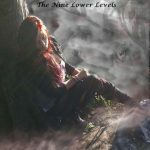 Her series all take place in the same world but feature different supernatural characters. 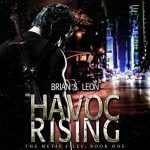 If you are new to this author, I recommend beginning with the Mageri series as a secondary character there becomes a key character in Crossbreed. As soon as I got this audiobook I listened. 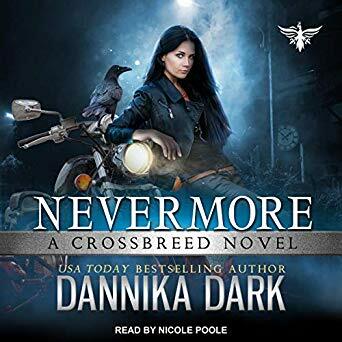 Despite my best efforts to extend my listening and therefore my enjoyment the events of Blackout, the previous novel, and the beginning of Nevermore, made that virtually impossible. Raven is visiting her Da. She and Christian aren’t speaking and trouble is coming. They say bad things happen in threes and so it is in Nevermore. However, Dark balances it all out with snark, character grow, humor and tender moments involving different characters. I love Keystone and while most of this story happens outside of the compound; we enjoy moments within its walls. I feared that miscommunication, stubbornness and outsiders would put a giant kink in the relationship between Raven and Christian. Both have endured so much. I admit the need for assurance kept me listening, even as I worried about the threat from the lions and a bitchy vamp. Then the whole thing with Keystone and Victor. Eek gads! There were funny moments like the barbs between Christian and Raven’s Dad or the run in Christian had at a certain BBQ establishment. Hilarious! I am hoping Dark has many more stories for these characters. 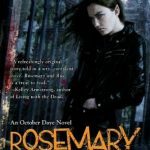 Fans of Cecy Robson’s Weird Girls, Ilona Andrews’ Hidden Legacy series and Patricia Briggs’ Alpha & Omega series will love diving into Crossbreeds. I would be remiss if I didn’t recommend and rave about the narration of Nicole Poole. Poole brings these characters, the situations and all the emotions to life. This series is perfect for audio and Poole adds another level of enjoyment. She is the voice of Christian and Raven. From accents to snark she makes me giddy. This sounds like an amazing series and that the narrator knows how to bring the characters to life that is one of my favorite things. It makes the books so much better. Great review Kim! I only looked at your star-rating, as I have this on my iPod to listen to once I finish listening to The Swedish Prince… I’m SO happy you loved it, Kim 🙂 I just love this series to pieces! It sounds like this is definitely your kind of fangirl series! I love how much you feel for the characters and everything that is happening, and it sounds like it made you feel all the feels. I need to try something by this author it seems because they sound great. Maybe I’ll try to audio them too. I’ve got to get caught up on this series. I’ve listened to the first three so far. I loved this so much I had to take a few days before writing the review because, whew, I was blown away. This series is one of my favorites and definitely in audio. Nicole Poole really tops the greatness of the book with a cherry! Christian stole my heart in this book (again), even though I was pissed at his lack of communication at first. It sounds like a glorious series, Kimberly! Thank you for the review. Glad to see this one is a hit. I love that cover. I am still trying to get the hang of audio. I have been binge listening to this series over the last couple of months. I just finished Blackout a couple of weeks ago and was thrilled that I didnt’ have to wait for this one. I got my copy yesterday! I’m so happy this was such a riveting installment! I have to get ar0und to meeting Raven sometime soon. Awesome review! Yay! I’m currently reading this, but I am sure I’ll be getting audio as well. Everyone should try Dannika’s work. People don’t know what they are missing. This sounds like a great series and since I haven’t read UF in a while I should probably add this to my list. Thanks for sharing! I really need to start this series! One of these days I’ll have to read one of her books. This is another series on my TBR! I’ve heard such fantastic things from you and two other friends. Nice to see that the series is still going strong. I need to check my Hoopla to see if they have them as audios. I need to finish her Seven series. I can see you had a good time with this one. Your enjoyment is infectious 😊.